1st Canadian Corps (also seen rendered as I Canadian Corps) was a corps sized formation created in 1939, though in England, it was named simply the Canadian Corps until such time as 2nd Canadian Corps was formed. When the Canadian Active Service Force was mobilized in September 1939, two infantry divisions were raised, and the "Headquarters, 1st Corps CASF" mobilized as Serial 1, under General Order 135/39 on 1 September 1939. A corps headquarters was not made necessary, however, until December 1940. While the 1st Canadian Infantry Division had proceeded to the UK in December 1939, the 2nd Canadian Infantry Division did not likewise proceed overseas until August 1940. General A.G.L. 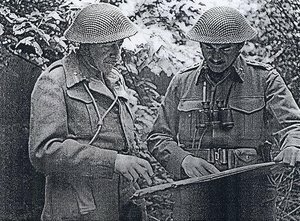 McNaughton, the senior Canadian in the UK, commanded the British 7th Corps from 21 July 1940 to 25 December 1940, with a staff that was a mix of Canadian and British officers. Certain junior British staff officers were also appointed to HQ 7th Corps. The Canadian Corps in England was formed officially on 25 December 1940, and designated simply "Canadian Corps" to distinguish it from other British corps. Canadian troops in England prior to 25 December 1940, including the 1st and 2nd Divisions, had come under command of VII Corps, which was disbanded after the Canadian Corps was formed. When the Canadian Corps was formed on 25 Dec 40 it took over the Staff of 7th Corps, and a gradual replacement of the British elements of the staff by Canadian officers was completed by July 1941. The system of two BGS appointments was abolished, and Brigadier Dempsey left H.Q. Cdn Corps officially after the first week of June 1941. Canadian Brigadier E.L.M. Burns OBE, MC, was made BGS of the Canadian Corps while his British counterpart Dempsey was promoted to command the British 46th Division. On 4 Jul 41, for example, Lt.-Col. W.L. LAURIE, O.C. 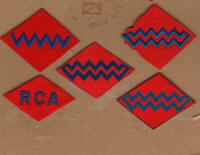 1 Cdn Corps Signals, remarked to me that not only was Brig. Dempsey exceptionally competent, but he was also possessed of a patient good temper which made him agreeable to work for, through it did not prevent his getting things done. As for Brig. Murison, he has perhaps been less universally popular, owing to a certain acidity of speech and a tendency to "rub people the wrong way"; but he too is considered a most competent officer. In conversation he gives an impression of decided intellectual force. It would seem that the British authorities (following honourable precedents of the last war) assigned very able officers to serve with the Canadians on the present occasion. It is interesting to note in passing that, whereas in the last war the senior staff officers of Canadian formations were in general, to the very end of the war, provided from the British Army, they are now being provided from among the trained staff officers of the Canadian Permanent Force. The mixed staff of 7 Corps was a special expedient adopted temporarily, and it appears rather improbable that similar circumstances will recur. The report added that with the exception of a British GSO III on staff with I Canadian Corps on 9 June 1941, the replacement of British officers with Canadian was complete. These functions (broadly speaking) are those which result from the fact that the Canadian Corps, though operating in the field under British command, is administered by National Defence Headquarters, Ottawa, through Canadian Military Headquarters, London. The present situation differs from the former one in that Major Rodger is responsible to the various heads of branches at Corps H.Q., whereas Brigadier Turner was responsible to General McNaughton. The Headquarters of the Canadian Corps, as senior formation HQ in the UK, was responsible for training each unit as it arrived. The Artillery Headquarters was tasked with training infantry and reconnaissance personnel in anti-tank weapons, establishing an artillery range, and supervised the tradesmen requirements of all Canadian artillery units in the UK, as advised by Canadian Military Headquarters (CMHQ). In November 1941, the Canadian Corps moved to Haywards Heath, Sussex, to join the South Eastern Army, tasked with defending Sussex against German invasion. By spring of 1942, considerable artillery assets had arrived in the UK, many being assigned as Corps Troops. Units included the divisional artilleries of the 1st and 2nd Canadian Divisions, four coast artillery regiments at New Haven, the 1st and 5th Medium Regiments, 8th and 11th Canadian Army Field Regiments, 56 Heavy Regiment, Royal Artillery (including under command X and Y Super Heavy Batteries), 1st Canadian Survey Regiment, No. 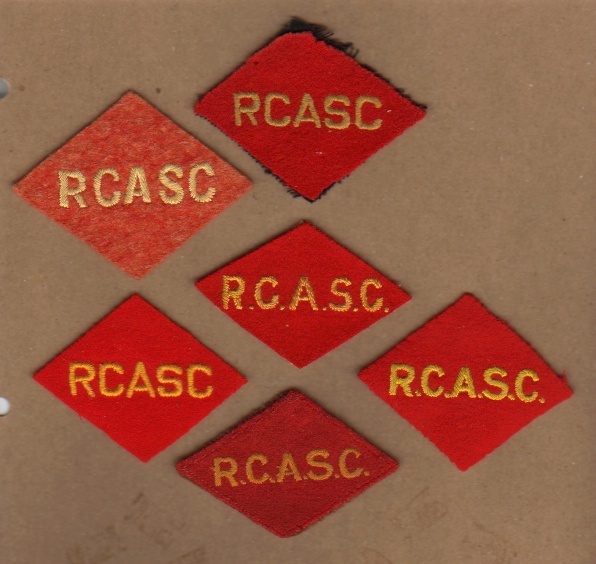 1 Calibration Troop RCA and 1 Canadian Counter Bombardment Officer Staff. GOC 1st Canadian Corps Lieutenant General H.D.G. Crerar, with his Brigadier General Staff (and future commander of 2nd Canadian Corps) Brigadier G.G. Simonds. As the Canadian forces in England continued to grow, a First Canadian Army was created in 1942 to oversee the growing list of formations, which came to include 5 divisions and 2 independent armoured brigades. When a 2nd Canadian Corps was created in early 1943, the Canadian Corps was redesignated 1st Canadian Corps. At this time, Headquarters 1st Corps Artillery (Serial 1) was disbanded under General Order 336/43 effective 14 January 1943. The 1st Canadian Division and 1st Canadian Army Tank Brigade left the U.K. for Sicily in the summer of 1943, and on 29 October of the same year, in a controversial move, 1st Canadian Corps sailed from Greenock, Scotland, arriving in Augusta, Sicily on 9 Nov 1943. After settling in at Taormina, the Corps headquarters crossed the straits of Messina by landing craft, then moved by rail to Altamura, Italy. The 1st Canadian Army Tank Brigade (later renamed 1st Canadian Armoured Brigade) would find itself under command of the 13th British Corps for most of the Italian Campaign. General E.L.M. Burns, one of the subsequent 1st Canadian Corps Commanders, wrote after the war that the employment of this corps headquarters in Italy was unnecessary and a drain on manpower, and that it also exacerbated the problem of finding experienced senior commanders. On 28 January 1944, 1st Canadian Corps Headquarters (now as part of the British Eighth Army) moved north to Rocca San Giovanni in the Ortona sector and relieved 5th British Corps in its defensive mission, with 1st Canadian Division and 8th Indian Division under command. When the 5th Canadian (Armoured) Division arrived in late February 1944, the 8th Indian Division moved to the British 13th Corps. In March and April 1944, the corps moved to the Foggia Plain, and rested and trained for the Liri Valley battle. After action in the Liri Valley in May and June 1944, the corps went into reserve, and a second infantry brigade was created within the 5th Armoured Division. The corps returned to the Adriatic sector in August 1944 and saw action at the Gothic Line, and the Rimini Line during August and September, with the corps finally going into reserve at the end of October. Action followed again in December, with the corps assuming a defensive posture on 30 December. Small attacks were continued into January, however, to provide a satisfactory winter defensive line. After the first week of January, a 27 mile front was settled into. On 10 February 1945, the corps received instructions to move into Army Group reserve, and 1st Division passed into the control of V British Corps, being relieved by 27 February 1945. The Corps was now ordered to rejoin the First Canadian Army in NW Europe, and the headquarters moved from Ravenna to Naples by road on 13 February, sailing for Marseilles, France on 22 February and disembarking on the 24th. The headquarters then travelled by convoy to Renaix, Belgium, and came under command of First Canadian Army once again, itself becoming operational on 15 March 1945. 1st Canadian Armoured Brigade came under corps command once more. 5th Canadian Armoured Division came under command in February, and when 1st Canadian Division arrived in March, came under 2nd Canadian Corps for its first operation before coming back under command of 1st Corps on 13 April 1945. Major operations of 1st Canadian Corps in the last month of the war included the liberation of Arnhem and the crossing of the Ijssel. The corps headquarters moved to Hilversum, Netherlands after VE-Day, helping control the repatriation of German forces from their area of responsibility, and was officially disbanded by General Order 388/45 effective 17 July 1945. 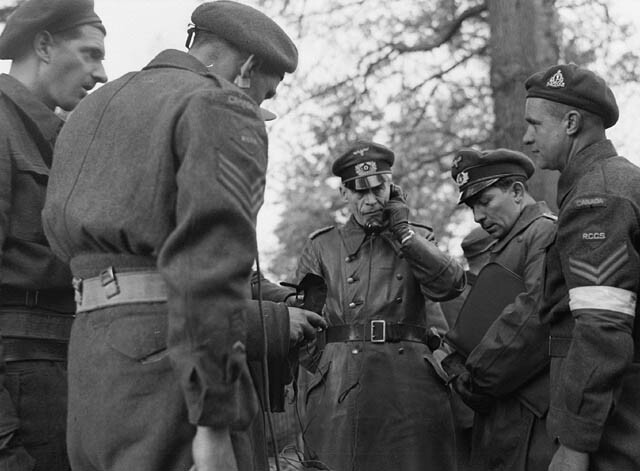 Major K. Henninger (centre), a German Army signals officer, speaks on a telephone linkup between Canadian and German forces at Wageningen, Netherlands, on 5 May 1945. Sergeant J. Stacy of 1st Canadian Corps Signals is at left foreground. The corporal at right shows clearly the white-over-blue signals armlet and the 1st Canadian Corps formation patch, with initials of the Royal Canadian Corps of Signals superimposed. LAC photo. Lieutenant-General E.L.M. 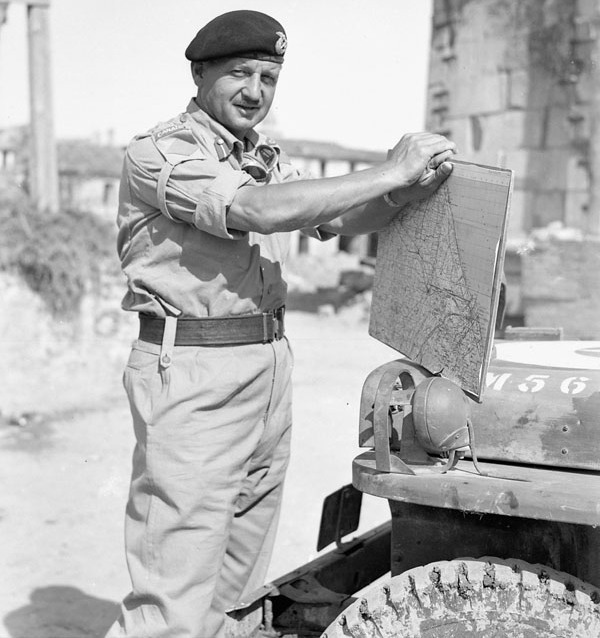 Burns, General Officer Commanding 1st Canadian Corps, consults his map en route to Rimini, Italy, on 23 September 1944. Nicknamed "Smiling Sunray" for his cold demeanour, the general has managed what passes for a smile for the camera. 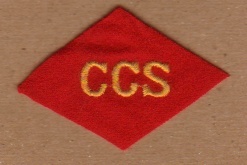 His 1st Canadian Corps formation patch is sewn to a kahki armlet, a common method of displaying insignia on khaki drill clothing in the Mediterranean. He has also affected the darkened web belt and black beret of the Canadian Armoured Corps. LAC photo. Lieutenant General A.G.L. McNaughton, CB, CMG, DSO 19 Jul 1940 - 5 Apr 1942 To command 1st Canadian Army. Actually relinquished command on 14 Nov 41 due to illness and return to Canada. Lieutenant General Edson Louis Millard "Tommy" Burns was a veteran of the Great War who had served in signals units, being decorated for bravery under fire. In 1939 he assumed the first of a string of senior staff positions, but was reduced from Brigadier to Colonel in 1941 when a letter to a married woman in Montreal - with whom he was having an affair - was found to contain many frank opinions of senior war leadership in Britain. He assumed an administrative post with the new Canadian Armoured Corps, commanded a brigade in the 4th Division (which he helped create), and eventually was given command of the 2nd Canadian Division. He would leave the division for a brief period commanding the Fifth Armoured Division after which we was promoted to command I Canadian Corps. Under his command, I Canadian Corps experienced some of its greatest victories, including the breaching of the Hitler Line. Burns' personality left him not well liked, and was nicknamed "Smiling Sunray" behind his back, a reference to the radio code word for a commander, prefixed by an ironic description of the unsmiling Burns. Lieutenant General Charles Foulkes was a prewar Permanent Force officer, who became Brigadier, General Staff of First Canadian Army, and assumed command of the 2nd Canadian Infantry Division in Jan 1944. He left the division to take over I Canadian Corps from E.L.M. Burns, who - despite his tactical successes in the field - was considered not to have the personality required of a corps commander. At the start of the Second World War, it was felt that colourful unit and formation insignia would be too easily seen, and a very austere set of insignia was designed for the new Battle Dress uniform, consisting solely of rank badges and drab worsted Slip-on Shoulder Titles. 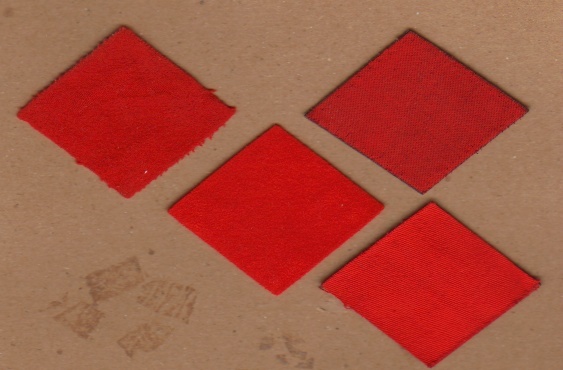 In 1941, however, the trend was reversed, and a new system of Formation Patches, based on the battle patches of the First World War, was introduced. 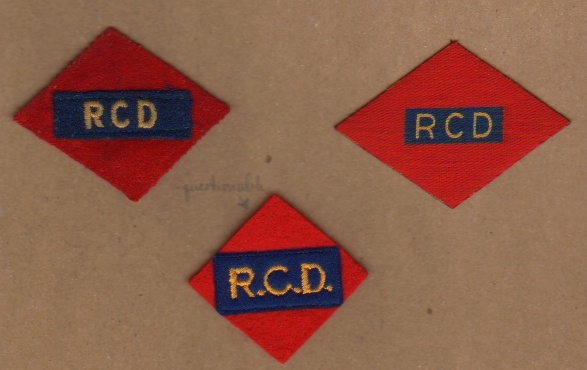 However, the use of lettered unit titles (at first won as Slip-on Shoulder Titles and later, as more colourful designs worn directly above the divisional patches) was also introduced - a privilege previously extended only to the Brigade of Guards in England, and in the Canadian Army to just four units: Governor General's Foot Guards, Canadian Grenadier Guards, Princess Patricia's Canadian Light Infantry and the Canadian Provost Corps. 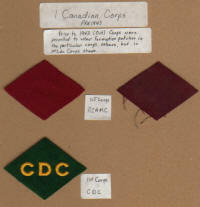 When 1st Canadian Corps was formed, it was not anticipated that a second corps would be raised; Formation Patches for units of some arms and services were thus rendered in the colours of their respective arm or service (ie emerald green for the Canadian Dental Corps, blue for the Royal Canadian Engineers, etc.) rather than in red. 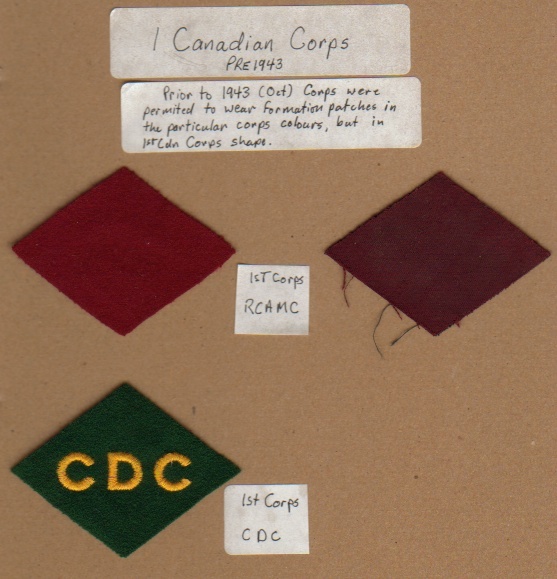 When II Canadian Corps was raised, and a blue diamond approved as its formation patch, some of the patches worn by I Canadian Corps units had to be changed from arm of service colour to the red of I Canadian Corps. Artifacts and images courtesy of Bill Alexander. Badge examples courtesy of Dwayne Hordij. 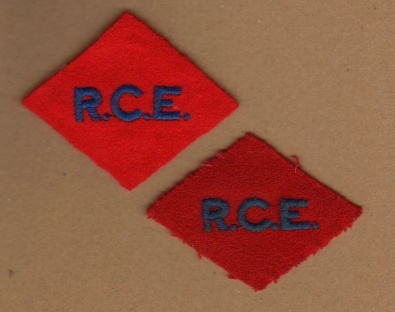 2nd Canadian Corps patch at left, with patch at right worn by Royal Canadian Army Pay Corps personnel of the Canadian Corps before the creation of 2nd Canadian Corps necessitated differentiation between the two corps by red and blue formation patches. 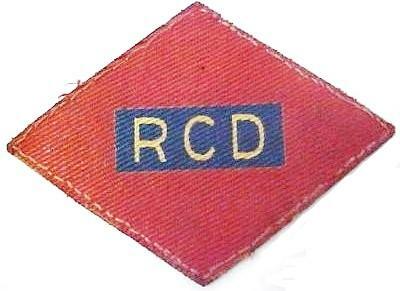 Canvas formation patch with the unit insignia of The Royal Canadian Dragoons. 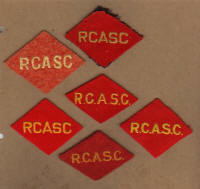 CSC Collection.